The number one destination for quality wholesale bathrobes in the US, Robemart features an extensive range of stylish and affordable options for style-conscious men and women. 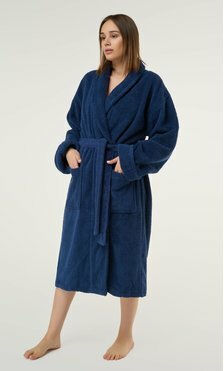 Whether it’s for anywhere you’d want to feel pampered, like hotels, luxury spas, clinics, or hospitals, or a special occasion like a bridal party, we offer premium quality bathrobes at wholesale prices. Made with ultra-soft cotton knits and a signature waffle weave, our waffle robes feel cozy soft and luxurious. Use it as a comfy and stylish cover-up at the pool or add a touch of luxury to the amenities at hotels and spas. Featured in popular colors, these robes also make inexpensive gifts that will be cherished for many years. Match your robes to a special color theme for a sleek and stylish look for men and women. At Robemart, we carry the widest selection of waffle robes in the trendiest colors in the U.S. Our waffle robes are available in short, knee-length and long versions, all made with ultra-durable cotton knits that get softer with every wash. Our customers love the plush-yet-lightweight fabric and high quality of the short waffle robe, our bestselling overall item, while the knee-length version provides coverage and easy movement for those beautifully cool-enough evenings where you wander between your outdoor patio and back inside to read on the couch. For a maximum amount of coverage, the long waffle robe keeps you warm while staying comfortably in place with a self-tie belt. Another popular style we offer is our satin kimono robes, a chic look that feels silky soft to the touch. Perfect for bridal parties, take lounging and relaxing to the next level with a variety of trending colors, from eye-catching pastels to classic neutrals and feminine floral prints. Whether you choose the classic and understated waffle style or the stylish and luxe satin kimono design, these quality robes make thoughtful and budget-friendly gifts for birthdays, holidays and other occasions. When you want to feel luxurious and pampered, Robemart features the perfect robe for all your needs. Outside of our bestselling waffle robes, we offer a selection of premium robes to take your relaxation experience above and beyond with different fabrics. You can take your waffle robe experience to the next level with our waffle shawl robe. Long in length, this 100% Turkish cotton option has our waffle weave inside and out, and features a velour shawl, cuffs, and pockets that add extra plushness to your relaxation. Our bamboo robes are ultra-soft, thanks to 100% rayon fabric made from bamboo. For a romantic touch, we’ve added a lace trim to the sleeves and bottom of the robe, making them a lovely choice for a night-in with your significant other or a girl’s night that needs a touch of elegance. Wrap yourself in luxurious softness with our terry kimono, a premium quality bathrobe and the ideal choice for five-star hotels and luxury spas. Your clientele will appreciate relaxing in comfort with 100% Turkish cotton. The plush terry also maintains its softness wash after wash. Other terry options include our terry velour robe, which features a shawl collar and hanger loop for storage, and microfleece robes. Along with a wide range of color options, you can also personalize your robes with a special hashtag or moniker that celebrates a once-in-a-lifetime event. Available in embroidery or vinyl printing, your monogramming order will be shipped in 3 days. You can even customize the robe to feature the logo of your business or organization. At Robemart, you can expect a seamless shopping experience with hassle-free returns and free exchanges. We also offer shopping incentives like free shipping on orders of $150 or more and quantity discounts. Shop our robe collection today and enjoy the look and feel of luxury at affordable wholesale prices.